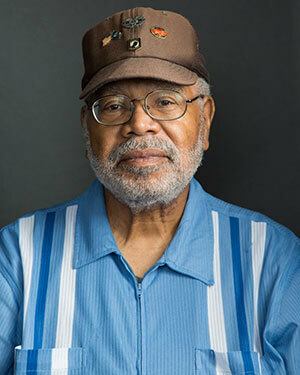 Alumnus Louis Cousins Sr. saved lives in Vietnam and managed labs for Methodist Hospital in San Antonio, but as a sophomore in a Virginia high school, he became something he never imagined — a civil rights hero. 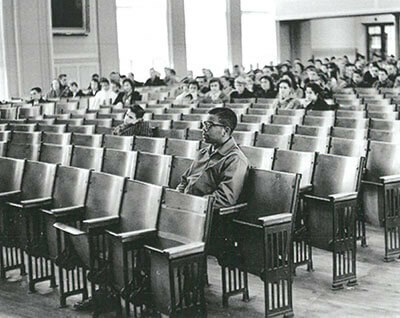 A young Louis Cousins sits alone in the front of the Maury High School auditorium waiting to be assigned a homeroom in 1959. This photo of 15-year-old Cousins was circulated around the world. Photo courtesy of the Virginian-Pilot. 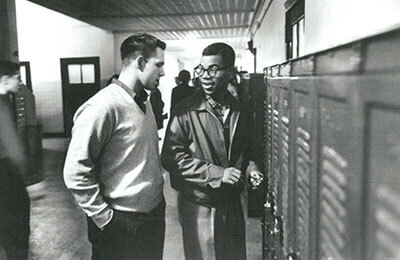 It was a cool February morning in Norfolk, Virginia, in 1959 when 15-year-old Louis Cousins Sr. (B.A. 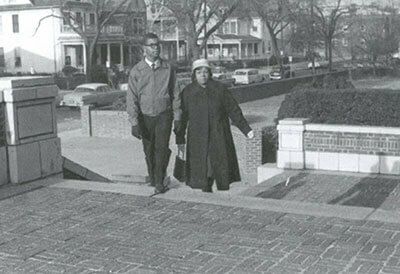 ’90) and his mother climbed the steps to the entrance of Maury High School. Their walk leading up to the school was “like a gauntlet,” Cousins said, with reporters, photographers, bystanders, students and parents lined up to watch history about to be made. Cousins was about to become the school’s first black student. Five years prior, the United States Supreme Court had ruled in the landmark case Brown v. Board of Education that the segregation of public schools for black and white children was unconstitutional. Virginia had opposed public school desegregation in a popular movement known as the Massive Resistance, which shut down public schools rather than allowing desegregation, leaving about 10,000 students in Norfolk out of school — the largest number of any school system in Virginia. It wasn’t until Virginia Gov. J. Lindsay Almond took office in 1958 that Virginia reluctantly allowed public schools in Arlington and Norfolk to desegregate peacefully. Still, some schools opted to remain closed in resistance to desegregation orders, but as the national spotlight turned on Virginia, they began to open slowly but surely — though not without more resistance, Cousins remembered. Cousins and his mother walk up the steps of Maury High School. The 17 students, including Cousins — widely known as the Norfolk 17 — were assigned among seven schools. However, Cousins was the only one sent to Maury High School, which had more than 2,000 students. Before setting foot inside Maury, Cousins was briefly part of a makeshift school in the basement of the historic First Baptist Church in Norfolk, where he was prepared by teachers to expect the worst and act accordingly: Don’t react to name calling, sit near the door in case of a need to escape, and sit in the front of class so that there will be witnesses in case anything happens. Cousins took the advice to heart; he sat in the front of Maury auditorium as he waited to be assigned to a homeroom. A photographer captured this moment of young Cousins sitting alone with an almost calm expression on his bespectacled face — a photo that would be featured in newspapers and magazines around the world. At 15 years old, Cousins became a national celebrity — one of the faces of desegregation. Cousins talks with a schoolmate. “Very few students talked to me because they didn’t want to be ostracized,” he said. While at Maury, Cousins endured nearly every conceivable form of prejudice. Only once did Cousins lose his cool, when a student spit on him; he chased the student into the principal’s office, where the student was expelled and Cousins was given an apology. Cousins looks at lunch options in the cafeteria. In school, Cousins virtually had no other shoulders to lean on. 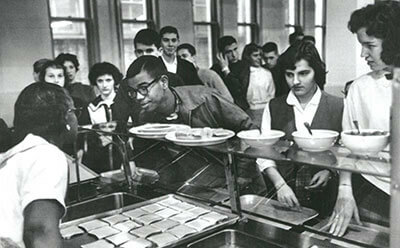 However, he fondly remembers the cafeteria workers — the only other black people in the building — who would serve him a little extra food and words of encouragement to make it through the day. In 1962, Cousins graduated from high school. He applied to the Norfolk division of the College of William & Mary (now Old Dominion University), but was not accepted because they weren’t accepting black students. He attended Norfolk State University for a year before enlisting in the Air Force. The decision to join the military was simple; he couldn’t afford college, and he needed money. Though not like his high school years, Cousins did experience racism in the military. The first city he went to for military training, Greenville, Mississippi, was segregated. During another stop in Montgomery, Alabama, Cousins and other black airmen had to take separate taxi cabs from the white airmen to get to base. Any leisure trips he took off base required traveling in groups for safety. “Ultimately, there’s a brotherhood in the military that goes beyond color,” he said. Cousins in Vietnam in 1968. He spent a year there as an Air Force combat medic. In 1968, Cousins was shipped off to Vietnam as a combat medic, where he served one horrifying year. “I saw and experienced things there that most people wouldn’t believe,” he said. Cousins frequently flew in helicopters with the Army’s storied 101st Airborne Division to Special Forces camps to conduct medical assistant examinations amid enemy territory. While there to care for the wounded — many shrapnel victims whose limbs were blown off — Cousins also learned to use mortars and .30- and .50-caliber weapons in case of attack. Equipped with a medical bag and a weapon, Cousins also carried a Yashica camera, shouldering the responsibility of photographer and documenting his travels throughout Vietnam. When the chaos subsided, he played chess and tennis to occupy his mind. 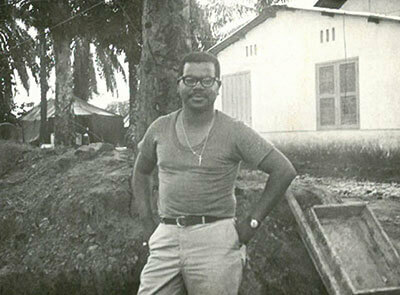 After departing Vietnam in 1969, Cousins transitioned from a military medic to lab technician. He and his wife, Deloris, whom he had met in junior high in Norfolk, eventually found their way to San Antonio. By the time he retired from the Air Force in 1984, Cousins had been doing part-time lab work for four years at Methodist Hospital. He then was hired full time and managed their labs until 2008, when he retired. Cousins attended numerous universities while assigned to various military bases, but upon leaving the Air Force, he wanted to finish what he had started many years prior: obtaining a college education. He learned that St. Mary’s University would accept his military training for course credit, so he enrolled and, after 18 months, earned a medical technician degree in 1990. Cousins said he practically lived in Garni Science Hall on campus and delighted in taking a chemistry class under the late Brother Charles Cummiskey, S.M. While Cousins has enjoyed retirement for nearly a decade — taking pictures of the city with his wife and spending time with his son, Louis Jr. — he has continued to crusade for equality most of his life by telling his story, which he said is largely unknown in the southwestern United States. He has spoken countless times at universities, churches and conferences throughout the years, and remains in touch with the surviving 11 members of the Norfolk 17. Cousins said he would like to write a book on his experiences, but isn’t sure when the project will materialize.